Positive traction geared belts and reduction pulley for MEGA POWER. No belt slipping when sewing heavy or difficult materials. Perfect for sewing sails, canvas, leather, upholstery, vinyl windows. 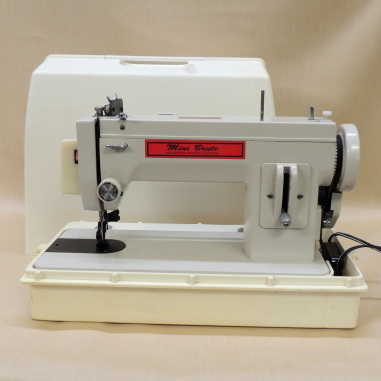 "i AM DELIGHTED WITH MY NEW SEWING MACHINE. MY HUSBAND AND I BOUGHT A USED 32' TRACKER PONTOON AND SOME OF THE COVERS/ENCLOSURES WERE MISSING. THEY ARE NOT AVAILABLE TO BUY ANYMORE, SO WE DECIDED TO MAKE THEM OURSELVES. MY SINGER WOULD NOT HANDLE THE JOB, SO WE ORDERED A MACHINE FROM YOU. 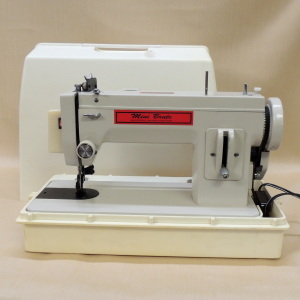 WOW, I HAVE NEVER USED SUCH A POWERFUL SEWING MACHINE. I LOVE IT. STILL LEARNING, BUT ABLE TO REPLACE TWO MISSING ENCLOSURES THUS FAR. OUR PLAN IS TO RECOVER THE WHOLE BOAT"
Very powerful and fun to use! All parts (excluding belts, bobbins, shuttle hook, needles, light bulb and needle plates) are fully guaranteed against factory defects in material and workmanship, under normal use, for five years from date of purchase. The first year is a complete warranty including labor and one-way shipping and handling. However, with the Owner's Manual and our Telephone Support, we can usually get your machine up and running as most problems are very minor. If for any reason you are not satisfied with your Mini Brute Long Arm, you may return it withing 30 days of purchase for a full refund!